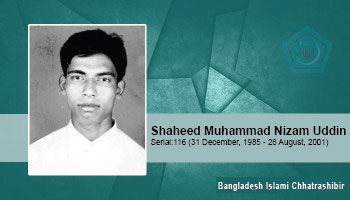 HSC examinee Nizamuddin was attacked by Awami League terrorists beside Dharmapur Government Primary School, where he attained martyrdom on 28 August 2001. He was on his way to the Sebar Haat via rickshaw from his home, when BCL terrorists viciously attacked him and then shot him to death..
Last study: At the time of martyrdom, he was HSC beneficiary from Choumuhani Government SA College. At the time of martyrdom, he was HSC beneficiary from Choumuhani Government SA College.